A recent piece that I wrote for Wise Guides. If you are thinking magnets, Eiffel Tower key chains and tacky t-shirts, think again. Hot on the successful revamp of French candle maker Cire Trudon, French-Moroccan entrepreneur/designer Ramdane Touhami now lends his golden touch to the legacy of Parisian perfumer Jean-Vincent Bully lying forgotten in the archives. Expect reinterpreted all-natural beauty products for the face, hair and body as well as water-based perfumes in elegant vintage packaging designed to steal your heart. Its earthy signature-white ceramic tableware are handmade in Paris and might be considered a steal compared to other boutiques with the same upscale rue Saint-Honoré address. For those with shallower pockets, the scented candles named after distant, exotic cities might be a better bargain. There are a couple with Paris references: Commune de Paris, Opéra and Rue Saint-Honoré – with lingering heady scents that will transport you back to the city of lights wherever you are. While this store might look a little intimidating to the casual shopper, don’t let that stop you from entering. It’s also an authorized retailer that stocks an extensive range of Opinel knives. Forget fancy Laguiole knives, this humble working man’s pocket knife can be found in almost every French household since 1890. Not to mention, handy for reliving those impromptu wine and cheese picnics when you get back home. The colorful children’s knives with rounded tips make particularly nifty spreading knives at picnics. Not particularly well-curated at the moment but it’s a good start for the official boutique of the Paris City Hall. One of the gems if you don’t mind lugging breakables on your homebound flight: Arrondissement carafes produced by the water supply administration. Stéphane Ashpool set up shop in Pigalle, the grungy working class red-light district he grew up in, stocking his understated fast-rising athletic streetwear label. Today, the tiny multi-brand boutique is a haven for out-of-towners venturing off-piste from Montmartre hoping to take home a piece of Parisian street cred. Logo tees and hoodies are popular picks. If you are lucky, there might still be some AF1s left off its recent basketball-themed collaboration with Nike. Not the most obvious choice if you are not hunting down foodstuff/wines cheaper than what is being sold at La Grande Epicerie for foodie friends back home. Some fashionistas have also been known to raid Monoprix’s clothing line for particular classic pieces, but me, I head straight for the affordable Duralex Picardie tumblers or, more often than not, Sophie the Giraffe teethers. It’s a pretty convenient made-in-France souvenir for the newborns of loved ones. Beats me why the exact same teether costs more than twice the Monoprix sticker price at Galeries Lafayette ! Protip: Make sure you head to a Monoprix with a toy/baby product section. Situated on a side street just two minutes away from hip concept store Merci, this small French ready-to-wear label is founded by brothers Lucas and Séverin Bonnichon in 2010 and channels laid-back retro vibes for the city-dwelling gentleman surfer. Boardshorts aside, if you are to buy only one item from this shop, you know it will have to be the “Surf in Paris” sweatshirt. Centre Commercial for the little ones, just round the corner from the original flagship. It prides itself on a carefully-curated selection of toys and ethical, made-in-France kidswear (yes to ridiculously cute tiny Saint James sweaters) and of course Veja sneakers. 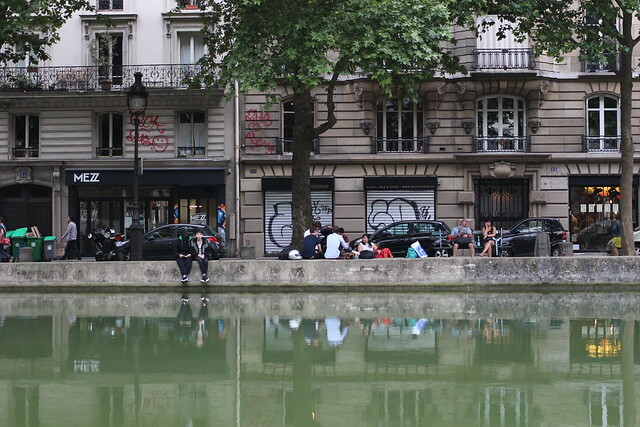 If books are more your kind of thing, you can’t go wrong at this graphic arts institution in the achingly-trendy neighborhood along canal Saint-Martin. Never mind that it is actually for French children, embrace your inner child and grab a copy of Berlin-based French illustrator Blexbolex’s award-winning L’Imagier des gens here. From music compilations, limited edition collaboration items to t-shirts, the Paris boutique of this French/Japanese cult label promises something for everyone and at every price range. Aw, am glad you found my list interesting. Let me know if you ended up getting anything the next time you are in Paris. Lovely blog you’ve got there !